With the Steelers one step higher on the Stairway to Seven, we know you’re more than ready for some football. Here’s what you might still be trying to figure out: What to eat when they take on the New York Jets in the AFC championship game Sunday at Heinz Field? Just a blessed few make the playoffs so, delicious as they might have tasted during the regular season, you’re going to want to think beyond traditional nachos and Buffalo chicken wings or dip for your tailgating and halftime menus; as an esteemed member of the Steelers Nation, it’s not just a fun idea to step it up a notch for family and friends, it’s your Black and Gold obligation. We’re realists here in Pittsburgh, though, so we understand that you want to be able to watch the game with as few interruptions as possible, kitchen or otherwise. 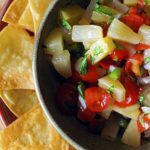 The answer is to choose appetizers and buffet-style dishes that can be prepared a few hours or even a day ahead of time, or be quickly assembled during commercial breaks or at halftime. Here are a few tasty ideas to get you started on your game day celebration; more will follow in the weeks leading up to Super Bowl XLV on Feb. 6 in Arlington, Texas. We tried to choose finger-friendly recipes that were familiar but at the same time offered a bit more flair. Admittedly, most won’t help with your New Year’s diet — this is football food, after all, best served with a cold beer and plenty of napkins — but you can always tighten your belt after the Steelers take the title. Chips you bake at home are so much tastier, and healthier, than the fried ones you find in a bag. The good news is they’re also easy. They’re best warm, right out of the oven, but also can be stored in an airtight container. In a rush, I made the accompanying salsa with canned Dole pineapple instead of fresh (be sure to drain the juices) and organic grape tomatoes because both were on sale. My kids were none the wiser. For a sweet treat, substitute flour tortillas for corn, brush with melted butter instead of oil and sprinkle with cinnamon sugar. To make chips, preheat oven to 350 degrees. Arrange the tortillas in a stack (do in batches) and cut the stack into 6 equal triangles. In a bowl, toss tortillas with olive oil and salt. Spread tortillas in a single layer on 2 large baking sheets. Bake, tossing occasionally, until crisp and golden, 20 to 25 minutes. Let cool. Makes about 4 cups of chips. 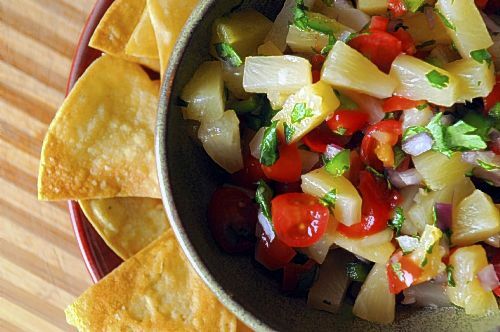 To make salsa combine pineapple, cherry tomatoes, cilantro, onion, jalapenos, lemon juice and salt in a bowl. Bread bowls aren’t a new idea, but they never fail to please. This onion-y dip is pretty heavy on the cheese, so to cut calories, consider serving it with crudites instead of bread. Or, go full out and offer it to guests with an order of homemade or take-out Buffalo wings. Melt butter in a medium-sized skillet over medium-high heat. Add onion and saute about 10 minutes, or until brown and caramelized. Remove from heat and set aside. Place the blue cheese, cream cheese, sour cream and pepper in a food processor, and pulse until blended. Transfer to a medium bowl, add onions and stir until well combined. Cut top off loaf of bread with a serrated knife and remove bread from inside, making it hollow. Leave about 11/2 inches thick on the inside. Spoon mixture into bread bowl. Wrap bowl with aluminum foil, leaving top uncovered. Place bowl on a baking sheet in the middle of the oven, and bake about 10 minutes or until the dip is heated through. Carefully remove the foil and continue baking another 3 minutes. Serve with pieces of sourdough bread or crudites. I stuffed them with a paste made from shrimp and scallions, but imagine they’d also be terrific with a pork, chicken or veggie filling. 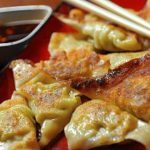 Pot stickers typically are made with round won­tons, but if you have to settle for square, like I did, not to worry. In a medium bowl, whisk together soy sauce, vinegar, Sriracha, sugar, ginger and sesame oil; set dipping sauce aside. Make pot stickers: In a food processor, process scallions, carrot, egg white and half the shrimp until a paste forms. Transfer to a medium bowl. Roughly chop remaining shrimp and add to bowl. Stir in 3 tablespoons dipping sauce. Working with 1 wonton wrapper at a time, place 1 scant tablespoon shrimp mixture in center. With a wet finger, moisten edge of wrapper, then fold over filling and press to seal. Cover filled dumplings with a kitchen towel while you work. Lightly coat a large nonstick skillet with cooking spray and heat over high. 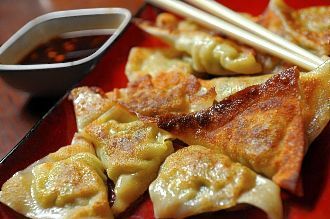 In batches, cook dumplings until golden brown on both sides, 1 to 2 minutes per side. Carefully add 1/2 cup water to skillet, cover and cook until water has almost evaporated and dumplings are tender, 3 minutes. Uncover and cook until remaining water evaporates (reduce heat to medium if dumplings are over browning). Transfer pot stickers to a plate. Wipe skillet clean between batches. Add scallion greens to dipping sauce if desired and serve alongside pot stickers. Tired of the same ol’ guac? At Seviche in the Cultural District, Chef Jeffrey Caulkins adds zip with tomatillos and jalapeno. Place tomatillos, jalapenos and chopped onion in a small saucepan and cover with water. Bring to a boil, and boil veggies for 3 minutes. Strain off water. Chop tomatillos and jalapenos. Combine boiled ingredients with lime juice, cilantro and salt; mix to blend. Allow to cool. Add remaining ingredients, toss and enjoy! ST. MICHAELS, Md. — You don’t have to be a crab fisherman, or even like crab, to appreciate everything this Victorian resort town on Maryland’s eastern shore has to offer. The view of St. Michaels harbor from the 1879 Hooper Strait Lighthouse, which once lit the way through the tricky waters of Hooper Strait. Blessed with charming shops and restaurants, an interesting Colonial back story and some of the region’s prettiest early 19th-century architecture — St. Mary’s Square, where early residents worshipped and sold their goods at an open-air market, dates to the late 1700s — it’s the perfect getaway for those who like a little history with their recreation. You do, however, have to possess nerves of steel to get there. Nestled on a narrow neck of land along the Miles River near the historic towns of Easton and Oxford, the drive from Pittsburgh requires a trip across the engineering marvel known as the Chesapeake Memorial Bay Bridge. This heavily traveled 4.3-mile span of concrete (do not, and I repeat, do not plan your visit during Friday’s rush-hour traffic) is among the world’s longest over-water structures. But it’s the height rather than the length that’s so dizzying: All that separates you from a 186-foot dive into the Chesapeake is a waist-high concrete jersey barrier. It takes an iron resolve, not to mention steady hands on the wheel and the ability to focus your eyes straight ahead, to make it across without wetting your pants. Let’s just say by the time I rolled into town on a sunny Thursday, I was more than ready for a mug of Crab Claw Ale at St. Michaels’ quintessential waterfront restaurant, The Crab Claw. No good deed goes unpunished, as the saying goes. Anticipating a long afternoon of sightseeing before checking into my room at the luxurious 1816 Inn at Perry Cabin, I also enjoyed one of the season’s most sought-after delicacies: a soft-shell crab sandwich ($15.95). My kids might scream at the sight of legs and claws peeking out from the slices of bread, but to me the crustaceans taste like summer — sweet and fleeting. It’s pretty common, in fact, for visitors to travel great distances to dine at The Crab Claw; the day I was there, Chuck Kosciuk got up at the crack of dawn to make the 240-mile trek from Lackawanna County in northeastern Pennsylvania with two buddies. 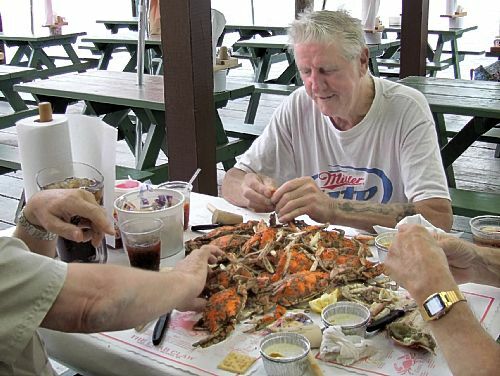 The object of their desire: dozens of Maryland blue crab steamed in Old Bay and spread out on paper on a picnic table ($36/dozen). 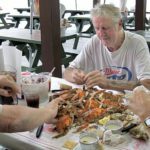 The Crab Claw restaurant in St. Michaels, Md., is famous for its steamed hardshell Maryland blue crabs. “And we’ll get more when we’re done,” he said, hammering away with a wooden mallet. This is the site of a bell cast in 1841. The bell rang every five hours between 7 a.m. and 5 p.m. to measure the workday for shipwrights in the nearby harbor. The square also holds the remains of a small cannon said to have been used in the defense of the town during the War of 1812. That Colonial skirmish is St. Michaels’ biggest claim to fame. Forewarned that the British “redcoats” were planning an attack in the predawn darkness on Aug. 10, 1813, residents hoisted lanterns to the masts of ships and in the tops of trees, hoping to trick them into overshooting the town with their cannons. It worked: Only one house on Mulberry Street was struck during the blackout. (After crashing through the chimney, the cannonball rolled down the staircase as the owner, Mrs. Merchant, carried her baby daughter down the stairs.) In 1980, the Federal-style house, dubbed the Cannonball House, was named to the National Register of Historic Places. “We’re the town that fooled the British,” said George Seymour, a docent at the St. Michaels Museum at St. Mary’s Square. Staffed by volunteers, the Mill Street building ($3, weekends May-October or by appointment) offers a fascinating view of village life from the 1800s. Among the memorabilia on display in the charming frame main home, built by waterman Jeremiah Sewell in 1865, are period antiques, a framed 1817 sampler, old photos and a biscuit worker machine from 1816, which, according to Mr. Seymour, was considered “newfangled” even during the Civil War. The adjoining Teetotum building, so named because of its resemblance to a toy top of the same name, offers equally interesting artifacts. Following its former use as a mortuary and a town jail, it holds a mortician’s carrying board, an affidavit verifying that a round iron missile did indeed hit the Cannonball House in 1813, and a diorama of the town from the same year. The partially restored Chaney house next door, built by three free African-American brothers in 1850, will eventually become a library and resource center and contain exhibits on black life in the community, noted museum vice president Chip Britt, who also leads walking tours of the historic waterfront. I ended up taking the $10 guided tour Mr. Seymour, 82, a retired psychiatric social worker, devised in 2007 to give “proper recognition” to famed abolitionist Frederick Douglass, who was born a slave in Talbot County and spent some of his youth in St. Michaels. Among the many stops during the 90-minute walking history lesson were the tiny cemetery behind St. Luke’s United Methodist Church on South Talbot Street, where Mr. Douglass’ owners, the Thomas Auld family, are buried, and the tiny house on Cherry Street where he spent three of his teenage years “unhappy and rebellious.” Determined to defy his slave status, Mr. Douglass fought the slave breakers hired to control his disobedient activities. In 1836, he planned to escape along what is now Route 33 with four fellow slaves but was caught, imprisoned and eventually sent back to Auld. Shipped off to Baltimore, he would end up escaping slavery for good in 1838. Mr. Douglass would return in 1877 to the Dr. Dodson House on Locust Street to visit a friend, and reconcile with his former owner, “slave and master on equal ground,” Mr. Seymour said. Given more time, I might have mulled that momentous get-together over a glass of Long Splice, a dry white wine crafted right around the corner at St. Michaels Winery in the historic Old Mill complex. A tour of Eastern Shore Brewing, makers of St. Michaels and Knot So Pale ales, also tempted. But the 26 buildings that make up the Chesapeake Bay Maritime Museum on Navy Point beckoned the loudest. 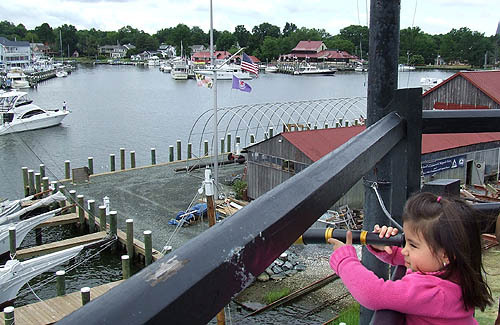 The Chesapeake Bay Maritime Museum anchors the town of St. Michaels, Md. 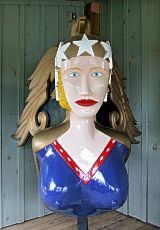 Its nine exhibition buildings include historic boating artifacts, such as "Miss Freedom," which adorned the bow of a schooner yacht that sailed for the U.S. Naval Academy's sailing squadron in the 1950s and 1960s. After St. Michaels outsmarted the British in the War of 1812, shipbuilding slowly gave rise to seafood processing, with Maryland blue crab and oysters the town’s primary fare. By the late 1930s, seafood packers were shipping 1 million pounds of crabmeat a year to wholesalers and retailers in Baltimore and Philadelphia, and up to 12,000 gallons of oysters a week. The exhibits, boats and activities at the 18-acre museum complex explore that history in depth. There’s a working boat yard where shipwrights and their students demonstrate traditional boat building and if you’re so inclined, you can sign up to be an apprentice for a day. There’s also an oyster exhibit, the nation’s largest collection of Chesapeake Bay watercraft, and a wharf where you can try your hand at crabbing or tong for oysters with a giant pair of nippers (which I ended up snapping in half. Oops!). My favorite building was the Hooper Strait Lighthouse. Built in 1879, with bare-bones quarters for a solitary keeper, this multi-story building is one of four surviving Chesapeake Bay “screwpile” lighthouses. 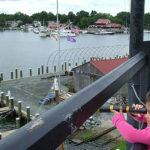 From the gated observation deck on top, you can see all of St. Michaels harbor. And talk about picturesque vistas. Boats of all sizes make good use of the town’s four marinas. 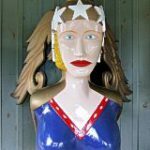 As befits a town popular with weekenders, St. Michaels’ main drag boasts an array of antique stores, quaint boutiques and art galleries. After browsing for collectibles at Oyster House Antiques and trolling for earrings at Silver Linings on South Talbot Street, I resuscitated my tired body with a homemade ice cream cone at Justine’s. Refreshed, I headed back to the inn for some quiet lounging at the water’s edge. Dinner a short while later at Sherwood’s Landing overlooking the Miles River was equally restorative, if not especially kind to the waistline.Yet who can say no to Chef Mark Salter’s signature Maryland crab spring roll? And why would you? It was odd, flying solo in such a romantic spot. But in St. Michaels, where the nearest traffic light is 11 miles away, relaxation — be it through history, seafood or the water — is the name of the game. Getting there: St. Michaels is 50 miles southeast of Annapolis along Route 50, and 73 miles south of Baltimore. From Pittsburgh, it’s about a 5 1/2-hour drive. But be prepared: the trip requires a scary 4.3-mile ride, 186 feet in the air across Maryland’s Memorial-Chesapeake Bay Bridge. It’s definitely not for the fainthearted, especially in high-speed weekend traffic! Where to stay: The premier hotel in town is The Inn at Perry Cabin, an ultra-luxurious inn with a full-service spa and four-star dining on 25 lush acres along the Miles River. Rates begin at $360/night (www.perrycabin.com; 800-722-2949). Visitors also can choose between two dozen inns and bed and breakfasts and a half-dozen hotels, including the value-oriented Best Western St. Michaels Motor Inn (rates from $159). Alternatively, vacationers can rent one of four historic homes in St. Michaels’ historic district through A Historic St. Michaels Vacation (www.ahistoricvacation.com; 1-703-732-2075). Prices begin at $775 in high season (May-Oct.) and $474 in low season (Nov.-April). Where to eat: Chef Mark Salter’s signature crab spring roll at Sherwood’s Landing in The Inn at Perry Cabin (1-410-745-2200) is a little slice of seafood heaven. Also worth the trip are the steamed Maryland blue crabs and soft-shell crab sandwich (in season) at Crab Claw Restaurant on Mill Street (1-410-745-2900). Bistro St. Michaels on South Talbot Street, a favorite with locals, offers classic French fare with Eastern shore accents (1-410-745-9111). More casual is Big Al’s Seafood Market on North Talbot Street, (1-410-745-3151), a carryout serving homemade crab cakes along with bait and fishing tackle. 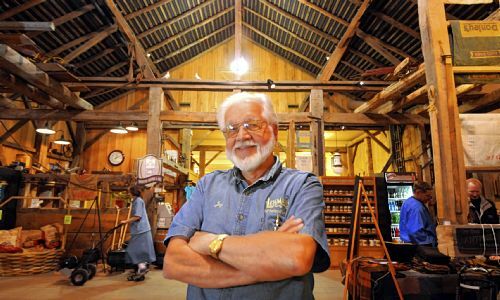 KIDRON, Ohio — To the scores of tourists who travel to the sprawling but somehow-still-charming hardware store that put this tiny farming community on the map a half-century ago, Jay Lehman is a local version of Bill Gates, an astute businessman who grew a tiny niche market into a global enterprise. 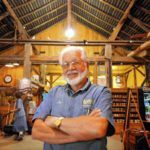 The rural store that bears his name has gone from serving a few hundred locals each year to one that peddles its old-fashioned wares (some authentic, others reproductions) to hundreds of thousands of customers in more than 200 countries. 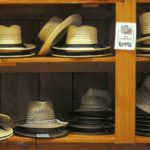 Half a million do their shopping each year in person, pairing a trip down hardware’s Memory Lane with a visit to Ohio’s Amish country. (The store is busiest during the fall and Christmas shopping seasons.) Others boost company sales through its 170-page catalog or extensive Web site, which features a toll-free 24-hour order line. Orders have been sent as far as Tibet. Yet the plain-living Amish who travel there by buggy in search of things no one else sells in person — a wood-burning cookstove or hand-crank mixer, perhaps, or a rebuilt Maytag wringer washer that runs on gasoline — probably have a different view of Mr. Lehman: that of a savior. Had he not bought the 30-by-40-foot hardware store perched at a crossroad in the center of town back in 1955, many of the items they need to live off the grid might likely have vanished. Nor would some of them have jobs. It’s gotten awfully tough in these parts to make a full-time living off the land, so a growing number of Amish are turning to cottage industries such as furniture making and arts and crafts for their livelihoods. 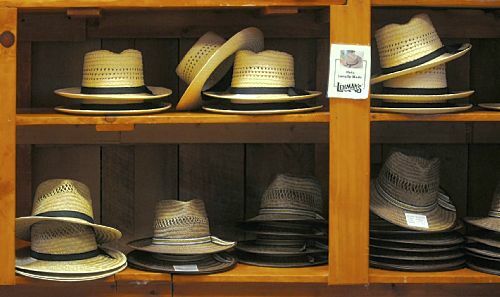 Lehman’s Hardware sells the fruits of their labor to other Amish, tourists and non-Amish locals. “Even if they can’t farm, they want to live on the farm,” Mr. Lehman softly explains. That said, the Amish today account for just 10 percent of his business. Replacing them at Lehman’s cash registers are nostalgia buffs and hobbyists, along with environmentalists looking for sustainable products and missionaries and homesteaders in search of appliances and other household items that don’t rely on power (composting toilets are suddenly hot). Pulling anecdotes from this modest, unassuming King of Hardware is kind of like yanking a 31/2-inch nail out of petrified wood. But Mr. Lehman tells a funny story about his first brush with Tinseltown in the mid ’90s. Out of the blue, he recounts in his vaguely German accent, a producer in Miami called looking for some old-fashioned oil lamps. And he needed them that very day! Accustomed to the simple life, Mr. Lehman couldn’t fathom how that might happen. But the voice from afar was persistent. Drive the lamps an hour north to the Cleveland airport, it cajoled, and then knock on a certain door inside the terminal. Someone on the other side would take care of the delivery. Well, if you say so … . Needless to say, the lamps arrived in Florida in time for the evening shoot. “I couldn’t believe someone would pay me to do that,” Mr. Lehman says, a touch of awe tinging his voice. The rest, as they say, is hardware history. A devoted Mennonite who still lives on the farm he grew up on (although in a new house), Mr. Lehman, who recently turned 80, is as surprised as anyone at his store’s success; he was always more interested in the hands-on “fixing” aspect of the business. That’s why he became a mechanic at age 17 for a local garage instead of following in his father’s footsteps as a farmer. “I didn’t want to get up early in the morning and milk cows,” he explains, laughing. Not that he was afraid of hard work: At 20, Mr. Lehman left Ohio for Frankfurt, Germany, where as a missionary with his church he helped build homes for refugees under the Mennonite Central Committee-run PAX program. “When someone in a suit came in, we’d wonder, ‘What’s he doing here?’ ” he says, chuckling. Mr. Lehman assumed he’d be a “small-time hardware guy” the rest of his life — especially because a second, three-year Mennonite Central Committee assignment in 1961 with his first wife, Ella Mae, that took him to The Congo and Kenya, where he made travel arrangements for missionaries, stretched to 13 years. (His father and brother operated the hardware store in his absence.) And indeed, he could have been perfectly content serving those living beyond the reaches of electricity, including the missionary community he’d come to know so well. Then came the Arab oil embargo, and Mr. Lehman’s natural entrepreneurial skills took flight. Back in the late ’70s, there were still Amish who insisted on plain-black cast-iron wood stoves, which the hardware store bought 60 at a time. When word got out about this alternative energy source, a supply of Warm Morning stoves that should have lasted three years sold in fewer than three months. And because he had an “in” with the supplier, Mr. Lehman got preference over the Johnny-come-lately stores that hoped to bring these sought-after appliances to market. At the same time, his missionary customers started asking for more of the hand grinders and gas refrigerators touted on brochures, jump-starting the store’s popular catalog division in 1979. The Year 2000 scare spurred a similar craze toward self sufficiency. Mr. Lehman recalls a phone call during a dinner in Greece in 1999 informing him “this Y2K thing”– he didn’t even know what it was — was “getting big.” Talk about understatements: So many searched the store for products that would allow them to survive a technological meltdown that it eventually had to bring on 30 additional workers. It still employs more than 100 people — 10 percent of whom are Amish or Mennonite. The latest boom is people who want to grow and prepare their own food, and those who have tired of a throwaway society. Today, Lehman’s is the go-to place for what daughter Glenda Lehman Ervin calls “the serious and the curious.” Mrs. Lehman Ervin, 46, became the marketing director in 1997 and her oldest brother, Galen, took over as company president in 2002; two other children are not involved in day-to-day operations. Consider it a low-tech version of Lowe’s. At least six additions over the years have increased its retail space to more than 30,000 square feet, which is carefully carved into more than 10 departments. Its cash registers, for instance, are in a hand-hewn barn dating to 1849 that was salvaged in nearby Orrville and reassembled on site three years ago. It includes Amish-made rocking chairs for the weary. But his Mennonite roots dig deep. While he enjoys the social interaction that goes hand in hand with being a proprietor in a small town, he’s “not so much a people person.” It’s more, he insists with a wave of the hand, about the old-fashioned machines his talented hands still collect and meticulously repair (some of it’s traded in) and then exhibit in the store. Occasionally, he’ll sell one of those museum-quality antiques. But most are for decoration, a gentle reminder of what used to be for future generations. Product is displayed in old wringer washer tubs; an 1883 jail cell from Somerset offers seating in the 2-year-old Cast Iron Cafe. The face on a Sohio gas pump is frozen in time at 1968 prices: a mere 26 cents per gallon. Some of the stuff he hasn’t a clue as to its use, like a wooden thingamajig — is it a chestnut roaster? — screwed to one of the barn’s beams. But he displays it anyway. “That’s just so Dad,” says Mrs. Lehman Ervin, about these blasts from the past. Semi-retired since Ella Mae died about 10 years ago, after 41 years of marriage, Mr. Lehman comes in late and leaves early, always in his denim uniform and always on the lookout for the next big thing. That leaves more time for tennis (remarkably spry for his age, he still plays every Friday), travel with his second wife, Emma, whom he married in 2001, and planting trees (30,000 in the past 20 years). And the octogenarian still maintains an office — actually, it’s just a corner desk with a view of the parking lot. “I’m having too much fun,” he says. WASHINGTON, D.C. — Abraham Lincoln was mortally wounded by an assassin’s bullet more than 144 years ago. Yet standing in front of the long black double-breasted frockcoat he wore to Ford’s Theatre that night in April 1865, its plain gray buttons almost within touching distance behind a thick sheet of glass, our 16th president looms larger than life. Exhibits showcasing the suit Lincoln wore the night of his assassination, the door leading to the famed theatre box and other relics from Ford's Theatre. At 6 feet 4 inches, Lincoln was quite tall for his times. But it doesn’t strike you just how far above his peers he towered until you’re nose-to-nose with the life-size mannequin displaying the bloodstained clothes taken off his body as he lay dying in the Peterson House, across the street from the theater. The square-toed goatskin boots that climbed under his trousers to his shins are equally spellbinding, if surprisingly shabby for a president. The size 14 shoes are worn down at the heels. Lincoln’s oversized garments, of course, could be seen as an allegory for his place in history: The man was huge, in more ways than one. It’s those in-your-face details, though, along with the variety of historical artifacts, videos and environmental re-creations displayed in the newly restored Ford’s Theatre Museum on 10th Street NW in the nation’s capital that bring Lincoln, his presidency and his assassination — the first of an American president — by John Wilkes Booth so vividly to life. It took nearly two years and $3.5 million to turn the subterranean museum, which originally opened in 1932 on the first floor and moved to the basement in 1968, into a 6,868-square-foot, state-of-the-art exhibition space. It reopened to the public July 15, on the heels of a $25 million, 18-month renovation of the working theater that sits atop it. (The new Ford’s Theatre made its debut in February.) You don’t need a well-thumbed copy of Ronald White’s “A. Lincoln: A Biography” on your bedside table to understand the wait was worth it. The new museum, free to the public, boasts the same fantastic collection of original artifacts belonging to the National Park Service that drew upward of 1 million visitors a year to the old site. Many are related to the assassination and the co-conspirators’ failed escape: Along with the thigh-high boot Dr. Samuel Mudd cut off Booth’s broken left leg after he fled the theater and the medical kit from which the doomed physician drew his supplies, visitors get to see the large bowie knife George Atzerodt would have used to murder vice president Andrew Johnson had he not chickened out; a reward poster misspelling David Herold’s name (it offered a $25,000 reward for “Harold’s” capture); and the diary Booth scribbled in a leather appointment book during his 12 days on the run. The palm-sized .44-caliber Philadelphia derringer pistol Booth used to shoot the president also is on display, seemingly suspended in air in its own case, along with a reproduction of the one-ounce lead bullet fired into the back of Lincoln’s head. Visitors are encouraged to touch the latter. Many other exhibits are brand new. Missing from the old museum was a historical context, an explanation of how the artifacts fit into the larger story of Lincoln’s life and why his death was so traumatic to the nation’s psyche. The new space helps stitch that story together by focusing not just on Lincoln’s murder and its immediate aftermath but by exploring his growth as a politician and orator, and his four years in the White House. The first thing visitors encounter after walking from the theater lobby through a recreated period rail car is a life-sized figure of You-Know-Who in a military cloak and cap. The eyes then are drawn to a knife, artillery goggles and pair of brass knuckles. In the days leading to Lincoln’s first inauguration on Feb. 23, 1861, a sign explains, aides caught wind of a plot to assassinate him as he changed trains in Baltimore on his way from Illinois to Washington. Reluctantly, the president-elect agreed to a change in schedule that took him secretly through Baltimore in the dark, wee hours. Moving into the museum, visitors learn that “Washington City” was a “raw, unsanitary place” in the 1860s, with geese and pigs clogging its partially paved streets. It was also full of opportunists: a gaggle of cartoonish statuaries represents the army of office-seekers and influence-peddlers that filled the White House’s corridors and offices from morning to night. Bios of Lincoln’s “compromise” cabinet are displayed in files inside a (wink, wink) file cabinet. Other displays explore the clashes between Lincoln and Chief Justice Roger B. Taney over slavery and secession, the skirmish at Fort Sumter, Lincoln’s revolving door of Union generals and, on a lighter note, everyday life in the White House. It’s all good, important stuff that will not only engage people intellectually, but also emotionally. Yet it’s probably inevitable that most visitors will linger in front of the exhibits that recount the tragedy of April 15, 1865, and the greatest manhunt in American history that followed. There’s something horribly mesmerizing about looking at the pine board that Booth used to wedge the door shut to the president’s box. Or the Treasury Guard flag that caught Booth’s right spur as he leapt to the stage after stabbing Maj. Henry Rathbone. Or the bloodstained pillow that cradled Lincoln’s head as he laid diagonally on a bed at the Peterson House. And the hour-by-hour timeline of how Booth and Lincoln spent that fateful Good Friday — the former gathers supplies while the latter attends a three-hour cabinet meeting and then goes for a carriage ride — is riveting. So, really, who can blame us? Getting there: The Ford’s Theatre National Historic Site (comprising the Ford’s Theatre Museum, Theatre and the Peterson House) is on 10th Street between E and F streets in Washington, D.C. It is within walking distance of the Metro stops at Metro Center and Gallery Place (for schedules, visit www.wmata.com). There also are metered parking and parking garages nearby. Hours: The site is open every day, except Dec. 25, from 9 a.m. to 5 p.m., with final entry into the theater at 4:30 p.m.; Peterson House is open 9:30 a.m. to 5:30 p.m. Keep in mind, though, that because this is an active theater, there will be times when the venue is closed for matinees, rehearsals and special events. After touring the museum, visitors can either walk through the theater or stay for a 30-minute presentation by the National Park Service or Ford’s Theatre Society. There is no re-entry after exiting the building. Admission: Free, but a timed ticket is required for visitors over the age of 2. Same-day tickets are available at the box office beginning at 8:30 a.m. on a first-come, first-served basis, with a limit of six tickets per person. For more information, call 1-202-426-6924 or visit www.nps.gov/foth. If you don’t mind paying a service fee, you also can reserve tickets through TicketMaster at www.ticketmaster.com or by calling 1-202-397-7328. Tagged: Abraham Lincoln Ford's Theatre Peterson House Washington D.C.
MOUNT AIRY, N.C. — Product placement is so ubiquitous today that most television viewers don’t even notice it. Back when sponsor Ford Motor Co. decided to showcase its Ford Galaxie 500 sedan on CBS’s “The Andy Griffith Show,” though, it was still a novel idea. It quickly caught on. Squad Car Tours of Mt. Airy, N.C. hits all of "Mayberry's" famous landmarks, including the Snappy Lunch and Wally's Service Station. But that’s what people love about Mt. Airy: the chance to dip their toes in the folksy, nostalgic, make-believe waters of Mayberry. It’s easy for Pittsburghers traveling Interstate 77 south en route to Carolina beaches or Florida to whiz past the ramp toward town (exit 100). But it’s just an eight-mile drive to Main Street, where many of the sites Mr. Griffith’s TV scripts famously referenced still stand, seemingly frozen in time. There’s the Snappy Lunch, where Mr. Griffith ate as a youngster (opened in 1923, it’s Mt. Airy’s oldest restaurant), and the nearly-as-famous Blue Bird Diner, where a “super” grilled cheese with bacon and tomato sets you back just $3.50. A few more steps takes you into Floyd’s City Barber Shop. Russell Hiatt, 86, aka "Floyd the Barber," has been cutting hair on North Main Street in Mt. Airy for more than 60 years. The shop is so popular that a half-million tourists, from every state and six foreign countries, have signed Mr. Hiatt’s guest book (Oprah included.) But while granddaughter Emily now lends a hand, he has no thoughts of retiring. “I wouldn’t have it no other way,” he tells me when I catch up with him after my tour, during his lunch break at Barney’s. A Squad Car tour also squires you past the relatively new Andy Griffith Museum and Playhouse (www.AndyGriffithMuseum.com), where a large bronze statue of Andy Taylor and son Opie, walking hand in hand, immortalizes the classic TV series. TV Land unveiled it in 2004, during the city’s annual Mayberry Days celebration. That was the last time Mr. Griffith, who turns 84 on June 1 and lives on Roanoke Island in North Carolina’s Outer Banks, was in town. One of the most popular tourist sites in Andy Griffith's "Mayberry" is Floyd's City Barber Shop in downtown Mt. Airy. A half-million tourists have signed owner Russell Hiatt's guestbook. The museum ($3) is the cat’s meow for Griffith fans: Dedicated last September, it holds the largest collection of Griffith memorabilia anywhere, most of it collected by his childhood friend Emmett Forrest. There’s the expected movie posters and playbills, of course, along with copies of the singer’s 78 rpm records and CDs in glass cases. (Did you know he toured the country with Elvis in 1955?) Also displayed is one of Don Knotts’ salt-and-pepper suits, one of Mr. Griffith’s trademark gray suits from the TV show “Matlock” and the pair of signs that hung outside the courthouse on the Mayberry soundstage before being retired to Mr. Griffith’s garage. Fun, but my eye was drawn to the more personal items from the actor’s childhood — his boyhood slingshot, kept under glass, and the baby rocker his father, Carl, made in 1927. Next door is one of the more curious tourist attractions. Conjoined twins Eng and Chang Bunker, originally of Siam (today’s Thailand), settled near Mt. Airy in 1837, married local sisters and between them had 21 children. An exhibit in the basement of the playhouse recounts their lives. Mr. Sickmiller also drives me past the modest frame home on East Haymore Street where Mr. Griffith was raised and is now a place for tourists to rest their heads ($175/night). The final stop is Wally’s Service Station (built in 1937 as a Gulf station) which adjoins a local re-creation of the courthouse seen in the TV series, complete with jail cells and Sheriff Andy’s desk. By then, you’ll feel like you watched all 249 episodes back to back of “The Andy Griffith Show,” which was No. 1 in the ratings during its final year, 1968. But what if you’re not mad about Mayberry? Turns out, Mr. Griffith isn’t its only claim to fame. Just a few blocks from Main Street lies the world’s largest open face granite quarry, a sprawling mass of solid rock that stretches 60 square acres and is a mile and a half deep. It’s so large, Mr. Sickmiller tells me, that it can be seen from outer space. As my kids would say, “Bor-ing.” Mt. Airians, though, are pretty proud that stone quarried here helped build some of the nation’s most venerated buildings and monuments, including the Smithsonian museums and World War II Memorial in Washington, D.C. So I ooh and ahh, too. Mt. Airy also is a good jumping off point for North Carolina’s emerging wine industry. The Yadkin Valley (www.yadkinwines.com) counts more than two dozen wineries — many within a 15- or 20-minute drive of one another. And don’t forget about the Mt. Airy Museum of Regional History, which educates visitors about the area and offers a panoramic view from a observation tower of the surrounding mountains. Getting there: Mt. Airy is about 360 miles south of Pittsburgh, or an easy six-hour drive on interstate roads. Alternatively, you can fly into Greensboro/High Point (about 65 miles away, and a center for furniture shopping) and rent a car. Airfare starts at about $250. Where to stay: Lodging depends on taste and budget, with everything from chain motels and camping to rustic cabins in the woods. It’s also possible to rent Andy Griffith’s childhood home within walking distance of Main Street (it’s owned by Hampton Inn and is decorated in ’40s style, $175/night). I stayed at the Sobatto Manor Bed & Breakfast ($129-$149), a beautifully restored Tudor Revival house on West Pine Street. My luxury room on the first floor came with a gourmet breakfast the next morning and a gorgeous garden in which to drink coffee. What to do: Mt. 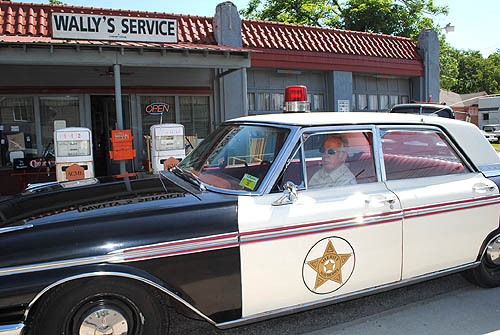 Airy is a mecca for fans of Andy Griffith and his movie and television work. But pork chop sandwiches at The Snappy Lunch and getting your picture taken with Floyd the Barber (86-year-old Russell Hiatt) aren’t the only joys of “Mayberry.” The Andy Griffith Playhouse offers local theater for $10 a ticket and free jam sessions on Thursday evening, and Main Street has some terrific boutique shopping. Outdoor types will enjoy fishing for trout and channel catfish in local creeks and rivers; there’s also canoeing on the Yadkin River and camping, rock-climbing, hiking and birdwatching at nearby Pilot Mountain State Park (14 miles south of town off Highway Route 52). And North Carolina’s Yadkin Wine Trail boasts more than two dozen boutique and big-business wineries/tasting rooms. And if you can’t make it this summer, consider checking out Mt. Airy for the 21st annual Mayberry Days, a fun weekend of pie-eating contests, checkers games, bluegrass music and more, Sept. 23-26. This year, the town is celebrating the 50th anniversary of “The Andy Griffith Show,” 1960-2010. 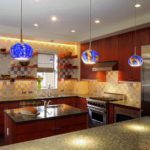 It’s often difficult to pinpoint the one design detail that sets the course of major home renovation. For Tom and Hannah Hardy, it started with figuring out what kind of lights would best show off a planned remodel of their North Side kitchen. It’d be an entire year before that conversation in 2004 materialized into a formal game plan detailing how to transform a cramped and dated space into a wide-open modern marvel. The project, finished in 2005, was a finalist in last year’s Renovation Inspiration Contest, small project category (less than $50,000). The entry deadline for this year’s competition, sponsored by the Post-Gazette and Community Design Center of Pittsburgh, is Friday. With its vibrant marriage of contrasting textures and colors and cutting-edge materials, the Hardys’ kitchen is contemporary enough that visitors could easily forget they’re standing in a Queen Anne-style row house built in the mid 1880s. But it’s not so far out that it feels out of place in the historic Mexican War Streets neighborhood, one of the city’s oldest. The custom maple cabinets by Dwight Palmer of Works in Wood in Glenshaw, for instance, are stained a warm cherry to mirror the hues of the original woodwork. 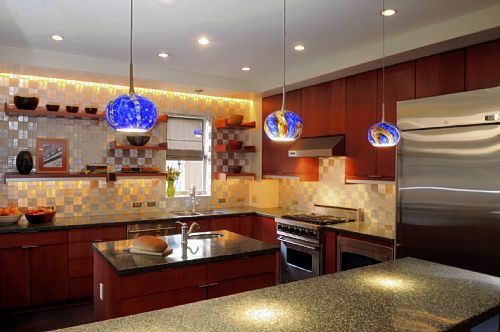 The colorful pendants that shine light on the bar separating the cooking and prep areas from the dining area reflect the home’s original stained glass. Even the unconventional crisscross of metallic tile on the kitchen’s far accent wall — handcrafted in Mexico from recycled aluminum — arguably have their roots in the past, as they’re reminiscent of the sterling filigree that was so popular during the Victorian period, says Mr. Margittai. As environmentally responsible as they are beautifully “green,” the 4-by-4-inch squares of metal would have provided a shiny foil to the cabinets when lined up square. But when the first samples of Alumillenium arrived, the architect quickly realized that if they turned the tiles 90 degrees, they’d catch the light just so. Hence the quirky checkerboard pattern. “We wanted a hint of something special when people walked in the door,” says Mr. Hardy, principal of Palo Alto Partners, a real estate consulting firm for nonprofits and private businesses. The fine flakes of aluminum milling scrap fabricated into the composite countertops (a material called Alkemi) also are unexpected, not to mention pretty much unheard of in the Pittsburgh area when the Hardys chose them, after months of research, back in 2005. (It’s now available locally at stores that sell green products, such as Artemis Environmental in Lawrenceville.) The commercial-grade porcelain floor tiles, discovered at Architectural Clay Products, measure a whopping 18 inches, so they have fewer grout lines. The floor plan is generally open, but it also includes a few dedicated spaces. There’s a built-in desk next to the fridge that doubles as a sideboard during parties. And the family, which includes 3-year-old Ezra and 5-year-old Galen, can choose eating at the long breakfast bar (perfect for a quick bowl of cereal) or big table in the windowed dining area. The remodel also included adding a small center island. At least one of Mr. Margittai’s ideas took a little finessing: To make sure the “floating” shelves he planned for the kitchen’s back wall could hold objects, Mr. Palmer of Works in Wood built mock-ups and weighed them down with sandbags. The couple was luckier than many in that they didn’t have to live in the house during its renovation by South Side contractor R.W. Ripley & Sons Construction, whose workers repaired plaster in every room and replaced the wood floors. Mrs. Hardy, program manager for the Pennsylvania Environmental Council, grew up in the neighborhood, and her parents who lived nearby were willing to rent them an apartment. In fact, renovating the three-story home’s interior wasn’t the couple’s first undertaking; they started by building a garage and patio behind it. The War Streets are often lauded for walkability — Downtown is just a 10-minute jaunt — but who wants to circle the block again and again in search of street parking? Other projects included a new gas fireplace and custom oak mantel in the living room, which opens onto a small deck, and a new hearth for the original marble fireplace in the front parlor. Separated by working pocket doors, they are more traditional living spaces with honey-brown hardwood floors, tall baseboards and elaborate crown molding. The couple also opted to take off fake stone cladding and an aluminum awning, revealing the home’s original red brick exterior. All that’s left to be done is, well, nothing. “We’re really happy with the way it turned out,” says Mr. Hardy. “We got everything we wanted.